Even though it has been a staple of the American seafood diet for decades, consumers tend to view the humble sardine as a “low class” fish: fit merely for workmen’s sandwiches, and recognized only for having once powered the now-defunct canneries of Monterey, California. The sardine has had rough times since Steinbeck’s Cannery Row. When sardine stocks crashed in the mid twentieth century, the canneries closed and the boom ended. Luckily, this dearth of fishing pressure gave the sardine population time to recover. Although the Japanese have traditionally used sardines in sushi, we are only just beginning to do so in the United States. As a result, it’s still relatively uncommon to see iwashi on the menu at your local sushi bar. 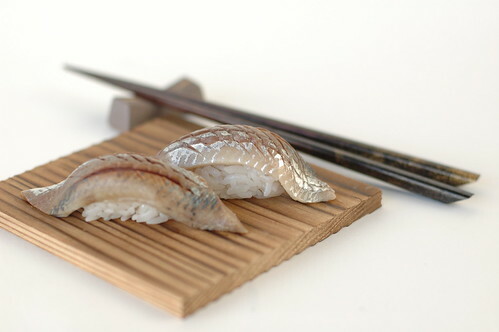 Only in the last few years have Americans begun to recognize the sardine as a tasty sushi fish. As discussed, Pacific sardine stocks have been shaky in the past. However, thanks to solid management and an inherent resilience to fishing pressure, the species has recovered and populations are currently very strong. Less is known about sardines from other parts of the world. While they may be safe options, it’s best to exercise caution. If given the choice, choose U.S. Pacific sardines over imported products. It should be mentioned that a number of scientists have theorized the existence of a “decadal oscillation”—a kind of back-and-forth pendulum effect between the populations of two species of fish in a given area. Off the Pacific coast of the United States, studies suggest that sardines and anchovies alternate in prevalence every thirty to forty years. Currently, the climate and state of the waters seem to favor the sardine at the expense of the anchovy. Should conditions change, sardine stocks may be affected. Right now, however, iwashi from the Pacific coast of the United States is an excellent option at the sushi bar. I just wanted to give a tip of the hat to you guys for a great blog. It's a pleasure to read and it has inspired me to seek out my own tinned treasures. You've got the best repository of canned sardine knowledge on the net right here. Keep up the good work! Hello do you know there is a special haiku on sardine ? Teo Furite Oyoide Yukuya Iwashi uri ! Can you feel the deepness of the image ? It probably has already occurred to you, and I am certainly not one to rain on a parade, BUT the iwashi look like a couple of flatworms draped over rice.